I've been invited to join this month's Progressive Eats dinner. What is Progressive Eats? Well it's a virtual version of a progressive dinner where people travel from house to house to share in different courses of a meal. For the virtual version a theme is chosen each month, members share recipes on their site and you go from blog to blog to check them out. This month's theme is herbs and it couldn't be more perfect for me. My garden herbs are growing wild and I love adding them to recipes when they are so fresh. Fresh herbs can dramatically change the taste of a dish, which makes experimenting with different ones fun. Just remember there are no rules when it comes to using herbs. Whatever you like is what works. We grow a variety of different kind: lemon balm, oregano, sage, basil, parsley, thyme, bay leaf, mint and rosemary. My favorite and the one I find myself using most often is basil. I love the fresh taste it gives to vegetables, specially tomatoes. When I saw this recipe online I knew I had to try it. A dip that features tomatoes and basil sounds like a dream come true to me. I switched it up a little to meet my tastes and it was absolutely perfect. Preheat oven to 450. Drizzle tomatoes with olive oil and sprinkle with sugar. (this is a technique I learned from Mario Batali) Roast until softened and starting to blister, about 30 minutes. Cool. 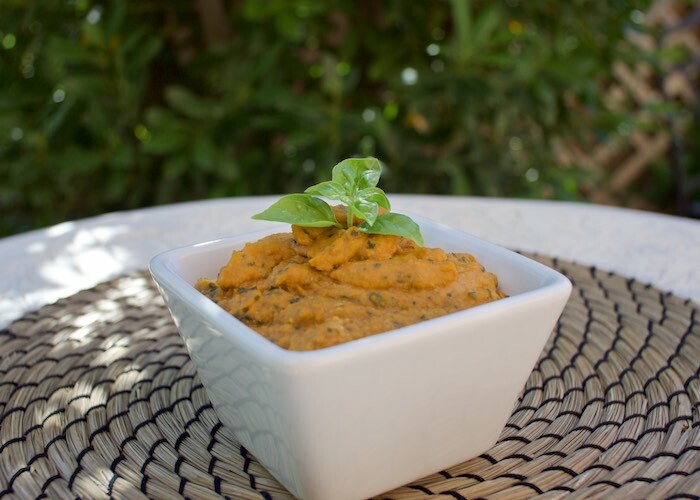 In a food processor, purée the chickpeas, tomato, basil, oil, cumin, until smooth and creamy. Add salt and pepper to taste. Add 2-3 tablespoons water as necessary to make creamier. Progressive Easts is a core group of 12 bloggers, but we will always need substitutes and if there is enough interest would consider additional groups. To see our upcoming themes and how you can participate, please check out the schedule at Creative Culinary. I love hummus, and this variation sounds perfect! I would spread it on all the sandwiches. Yum! I love hummus!! And I especially love when people do something creative with the flavor! I have not made my own hummus yet but i have been dying to! Printing now! I'm a huge fan of hummus and would love to make this version! It's a perfect way to take advantage of all the tomatoes at the market right now! I am totally digging this tomato basil hummus! Especially with it being tomato season! I've made sundried tomato hummus but have yet to make it with fresh tomatoes and basil - love this idea! Great addition to our Progressive Eats menu for July! I love hummus in any way, shape, or form - this needs to be infront of me with a stack of warm pita right now. Wow, you are growing so many herbs! Jealous. This hummus looks amazing. Sounds fantastic! The plum tomatoes are perfect in this dip! I adore hummus and love the idea of adding tomato and basil. Can't wait to try! Tomatoes and Basil in Hummus. Oh yeah, pass the chips! We have an herb garden in our backyard and I love being able to use those flavors during the summer. This dip look like just a thing for the extra basil! I LOVE hummus and have whipped up many varieties, however I have never thought to add in tomatoes - genius! I can't wait to try this! We love homemade hummus, especially one’s with some extra flare like this one! Always eager to find new ways to use summer tomatoes and this is perfect. Is there a brand of chickpeas you prefer using? I have about the same herbs. I left a huge garden and now mine are all in big pots and I sort of love it. Right off the patio; no longer at the far end of the yard...I think I use them more often! Just love these flavors; two of my favorite summer things in one bowl! I think I just commented on this recipe on your Facebook page as well, but I can't resist commenting again. Looks sooo good. I'm going to try it your way. I used sun dried tomatoes, but I would think that roasted tomatoes would add a whole new depth of flavour. I could live on hummus! And tomato basil is one of my favorite combos. YUM! I love hummus and this one looks great. I have overeaten my curry hummus recently and could do with a change so I might try this one next! I love Hummus and this combination of flavors you've shared really sounds delicious! I really like the addition of cumin in this hummus recipe! I love hummus! I will try! This looks so delicious, Theresa! :-) I love hummus! I have tried sun dried tomato hummus but it can be hard to get them going in the blender. This method sounds easier and fresher...Love the concept of a virtual progressive dinner.. The recipe sounds delicious as well! !